The DCS391B 20V MAX 6-1/2 in. Circular Saw with a 6-1/2 in. carbide tipped blade operates on a powerful 5150 RPM motor with a 0 to 50-degree bevel capacity on a lightweight and durable magnesium shoe. used for shop, dimensional lumber cutoff, ripping, smooth easy cutting with new blade. Plastic guards, metal shoe, reliable and more durable than similar but 1 inch smaller Porter Cable. Light and powerful, I really am impressed with its cutting ability.I am a carpenter with 40 years working with the trade, and don't impress easy. Can’t beat going cordless. Powerful enough, cuts straight, safety is solid, light. All around solid skill. When it came time to renovate my basement, I knew I would need to update my old DeWalt 18v tools. My wife gave me clearance to buy every tool I would need. I’ve always been a fan of DeWalt, so it was an easy choice. I loaded up on DeWalt 20v tools. This saw is tough as nails. I use it for everything including pressure treated 2x12 stair stringers. It is super convenient to be cordless AND powerful. If you are reading this, just buy it. You will not regret it. This is the first cordless tool that I have purchased besides drills and impact drivers. This saw has tackled every job I've thrown at it. Make sure to have a 4 or 5 Ah battery and the proper blade for your job and you will never have to worry about running out of power. Great saw with 5.0 battery. Received this as a birthday present. I use it with the 5.0 20V max battery that came with my leaf blower and I am extremely impressed with the power and battery life. I bought this saw to cut off some bad half log siding. It is light enough that I could use it one handed off a scaffold though I would not recommend it. I had bought it as part of a kit and it had a 1.5 aH battery pack. You really need a bigger capacity battery for any extended cutting at all. The saw really burns through the charge. I do have another 1.5 battery to use, but they take time to charge. This is the first cordless circular saw Ive owned. I love the weight and the maneuverability of it. I had to get the 5Ah batteries because the 2Ah wouldn't last but a few seconds cutting through plywood. My only issue is that the switch keeps overheating and melting. I have repaired it once and now I cant anymore. A new switch is $87 so I might as well buy a new one as I don't want to waste my money and risk it happening again. Dewalt, sell the switch and not the whole assembly. Does this saw include the blade? BEST ANSWER: Yes, it comes with a framing blade. Will 1.5 amp batteries run this saw or do you need 3amp? 2, 1.5's you'll be ok for the moment unless cutting 2x4, 2x6 continuously. Yes, the 1.5 ah 20v Max batteries will work on Dewalt model dcs391b. It is recommended to use the 3.0 ah or larger batteries due to power consumption. If you mean 1.5Ah vs 3Ah, then yes, it will work. It just won't run as long. Can you change the depth of the blade with this saw? BEST ANSWER: Yes, it is infinitely adjustable. It is just a quick turn clamp that you loosen and tighten by hand a the desired depth. Does it come with wrench for blade? BEST ANSWER: It doesn't come with a wrench, has an allen key to remove the blade that is attached to the saw. Yes the hex wrench sits into a slot on the saw. The DCS391B does not come with a blade wrench. I have a he dewaltt DW 936 18 volt trim saw and wanted to purchase this also, but wondered if this saw is also a trim saw,nor more of a heavier duty saw. BEST ANSWER: That unit will be more heavy duty than a comparable trim saw. This unit will be more heavy duty than a comparable trim saw. This saw is heavy duty enough for most general jobs. 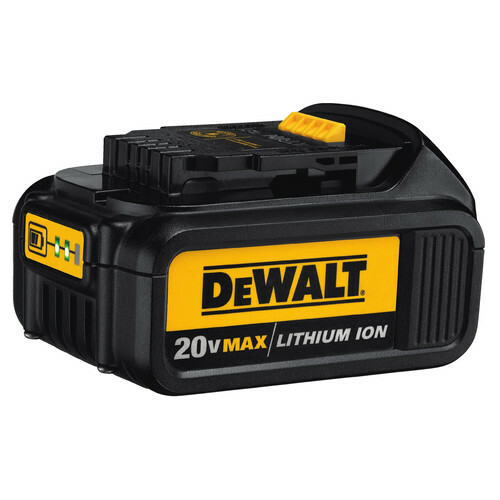 What AMP battery should I order for the Dewalt DCS391 20V cordless saw? BEST ANSWER: If you plan on using the saw for a serious project where you will be doing a fair amount of cutting, you should go with the 5Ah (DCB205), or at a minimum, the 4 Ah (DCB204). Hope this helps. You would at least need a 3.0 battery to get the most cuts. 4.0, 5.0 and 6.0 would also be recommended. Will a 20 volt 1.3ah battery work in this saw. Those are the batteries that came with my impact driver. BEST ANSWER: Yes, all of the 20V MAX batteries are interchangeable. Yes, all of the 20V MAX batteries are interchangeable. will the saw cut ipa wood successfully? BEST ANSWER: Yes, it will work on IPE wood. It came with batery and charger? BEST ANSWER: No, bare tool. Do you ship to Maldives? BEST ANSWER: CPO only ships within the United States at this time.